Lauren was great! Responsive and easy to get in touch with. Left a personal belonging behind and she agreed to ship it to my home for me. We loved it! Beautiful room, clean well kept property. Less crowded than some other areas of the beach. Cant wait to come back! The staff was very friendly and helpful. They were quick to answer any questions before and during our stay. Everything was incredibly easy! Great instructions for keys and how to get in, we were totally prepared and set up for a great stay! 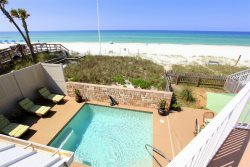 A great condo with everything youd need, and a fantastic location in Panama City Beach. Staff was very quick to respond and helpful over the phone. Got us booked with a great deal on the property that was perfect for us! I contacted the property manager several times during before our trip. She was very pleasant and responded very quickly. I was very pleased with the service. We enjoyed the house , the trip, and the beach very much. This is our second year and we will be returning again next year. Very helpful, no issues, very well explained and clear communication. Is a great place and very well priced, we were all very confortable and very happy to have rented this good extraordinary place right next to the fun. We plan on coming back next summer. Working with Toni makes everything go smooth. She takes care of anything I need when booking. Look forward to our next outing. Such a peaceful and enjoyable time. Is like home away from home for us. We had an issue when our 1 yr old granddaughter had an accident in the pool one evening. I made a call the next morning and the pool maintenance gentlemen was out within an hour and a half. He was super nice and had the pool fixed up in no time. The house was great! Plenty of room for our family. It was very close to the beach and within walking distance to several activities, restaurant and shopping. The pool was plenty big for our family to swim in and safe enough for the 1 yr old. I would definitely book this home again! It was an easy rental and the stay was very nice! The complex is well cared for & the pos were very nice! Beautiful condo. Property was clean. Grandchildren loved everything. Everything was great! The emails for check in and check out procedures were great, simplified and easy! The HOA office was very friendly also! Overall an exceptional experience and stay! It made our whole trip enjoyable! Extremely nice condo with an amazing view! The price was unbeatable for the gated parking lot beach accessibility, pool and all the wonderful amenities and ease of use. We will definitely be back!